A weekend trip into Manchester, we headed to the Corn Exchange, one time posh shopping area it saw a downturn in fortunes for a few years but has now been transformed into an eating mecca. 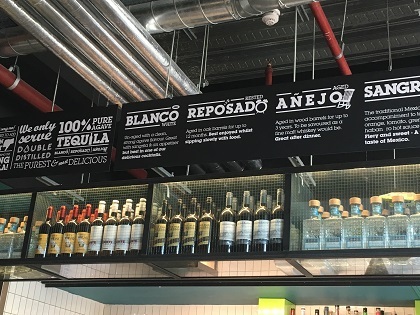 Spoilt for choice, we eventually opted for Mexican food at Wahaca. Our last experience at this restaurant was in Covent Garden a few years ago. Son, then at his picky eater phase ate nothing and Husband wasn’t overly impressed. I loved it…. We decided to try again today, the deliciousness wafting from the doors could not be ignored. 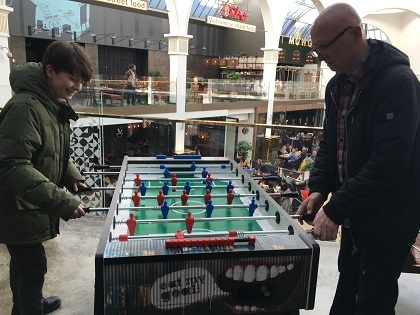 A long wait for a table, it is obviously very popular but we had no problem hanging around, the table football game kept the gents entertained. Eventually we were seated and this time were definitely not disappointed with the food. We all had something different and everyone was more than happy with their choice – absolutely delicious, a real explosion of flavours and the food and chilled out atmosphere was spot on. 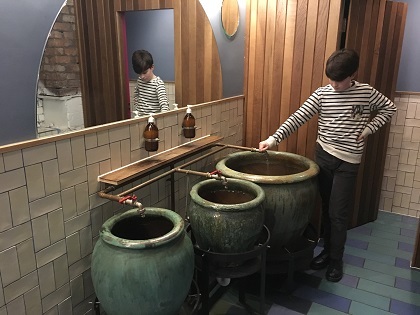 Son was a wee bit impressed with the sinks in the toilets too…. Afterwards we decided to visit the People’s History Museum, the weather was wet and we wanted to be indoors so this was our choice. Many a time we have strolled past this building and never given it a second glance. Today we wanted to see what was inside. The building looks modern from this outside angle but it was once a hydraulic pumping station and is now Grade 2 listed. It has been redeveloped, sits right on the River Irwell and apparently is near to the pub where Karl Marx and Friedrich Engles are supposed to have met in the 1840’s. 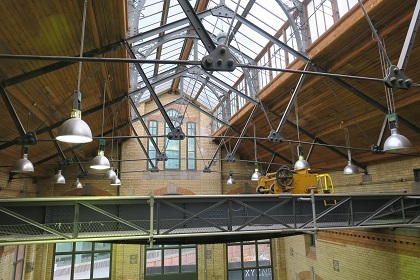 I loved the building – light and airy, it is a clever mix of old and new. The cafe looked very good but having pigged out on Mexican food we had no space left for anything else. 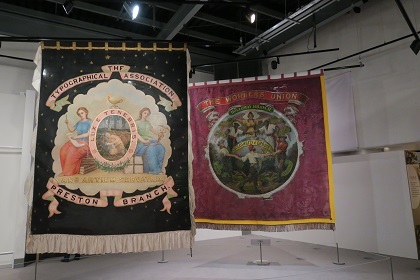 The museum covers social history from the time of the Peterloo Massacre to the birth of the trade unions right up to the present day. They claim to cover all political persuasions here and do have some Liberal and Conservative party information but it is most definitely left wing and Labour biased. 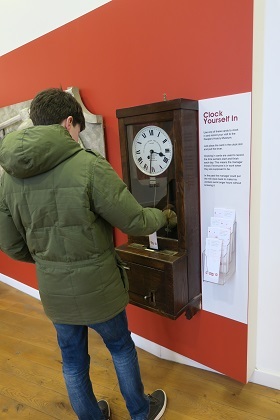 We had a look around one of the displays in the art gallery then made our way to the two main exhibition areas. 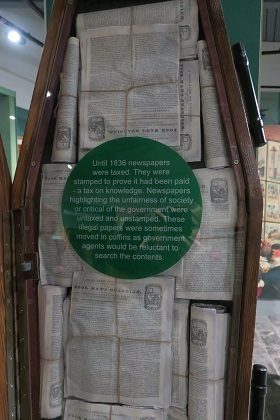 They are divided into themes and follow a chronological order starting 200 years ago with the Peterloo Massacre. 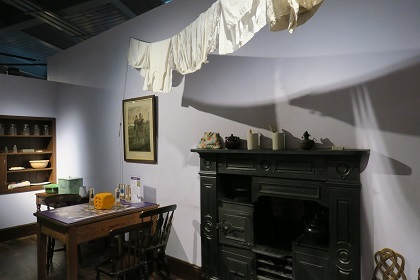 The first gallery had lots of information and stories about Manchester during the Industrial Revolution and the terrible living conditions for the majority of the people. We found stories about the suffragettes and the battle for women to vote, the whole area finished up at the end of World War II. 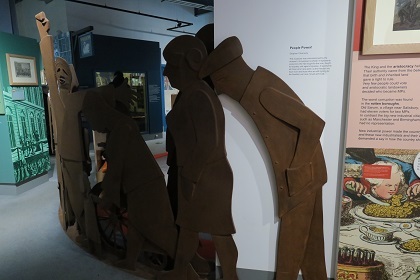 The next level had artefacts and displays from 1945 onwards with much emphasis on politics and the political parties. 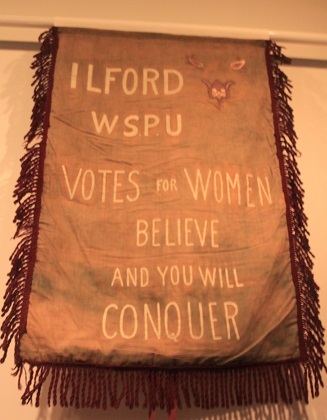 They have an enormous number of old banners, including the oldest surviving trade union banner in the world. 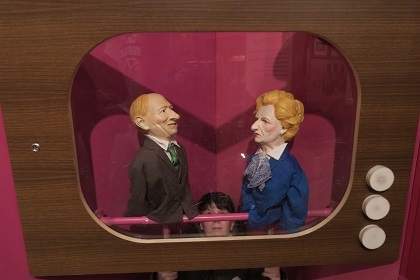 We saw the minutes of the first meeting of the Labour party and Son had some fun with a couple of rather famous Spitting Image puppets. 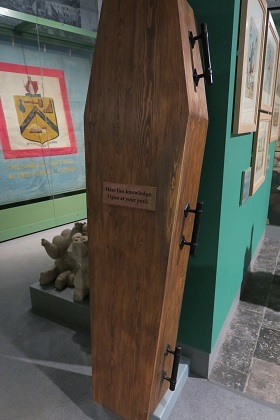 The museum was free and had plenty of hands on activities and things for children to do in each area. Son was more than entertained, the whole place covers politics and reform in an interesting way. 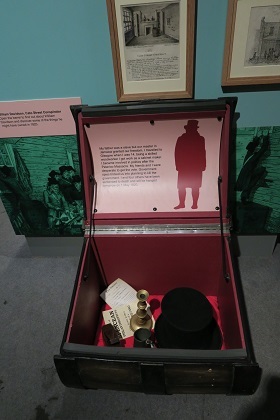 He particularly loved the life in a box exhibits – boxes here and there filled with items relating to someone’s life or job that you could pick up, touch and read about. They were based on real people. We spent a couple of hours here, it most definitely has a left wing bias but no matter your political persuasion it is educational and interesting. You visit such interesting places, Joy! Great post, as always. Thanks Sue – it was a fun and educational day out! I know you were pleased to have had a great experience with the Mexican food…we have so many Mexican restaurants in our area. The museum certainly looked interesting…it looks like a good day for all! It was a great day Pam – good food and a fascinating museum, we all loved it! Hope you have a wonderful weekend. How exciting to hear and see Mexican food finding its way there! We love Mexican food. On our trips to the UK we couldn’t find Mexican. We found Spanish food, but it’s not the same. This is a really good restaurant if you are back in the UK – they have quite a few in London and then some other cities as well. The food is delicious, very authentic and I definitely recommend! We visited that museum last time we were in Manchester a couple of years ago. 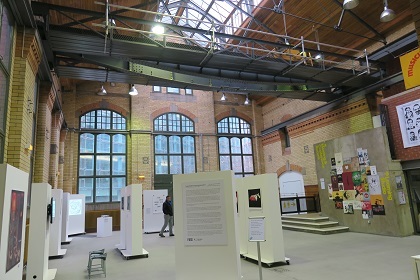 I wanted to see the banner collection – very impressive. It’s strange, we’d been past it so many times but never gone inside. It was well worth a visit, the banners are superb. 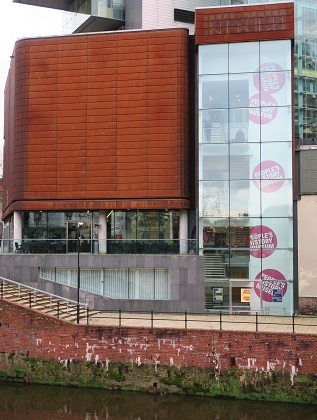 I’ve not heard of the People’s Museum but as I enjoy social history I’ll try and pop in sometime. I’ve been in the Corn Exchange but not eaten at that Mexican but the food looks tasty. The food was delicious, definitely recommend if you’re in the area!! 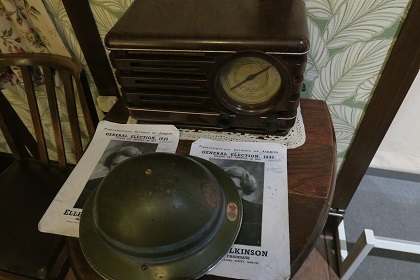 The museum is great too, well laid out and lots of interesting social history, we enjoyed our afternoon there. What a fascinating story Rosemary – did you do the research? I love those programs about people’s ancestry and it sounds like your family history would merit an appearance on one of those!! The museum was great and a bit of an eye opener to how it was for ordinary people at one time. We’ve got some dull gloomy weather but still trying to get out and about over the weekend! Hope yours is a good one too. Wow Rosemary, sounds like another fascinating tale – you have wonderful ancestors!! My mother-in-law has done a lot of research into her and my father-in-law’s family history and found some compelling stuff as well, including ancestors who were shipped off to Australia in the 1700’s. How interesting too that your daughter is now in London!! Hope you relax after the babysitting and the storms pass quickly! That museum has been on my to do list for some time. A bit cheeky of you to sneak into the gents to get that shot of the water basins! Oh no, not me!! Husband took the picture – I am not that brave and our son would have disowned me had I ventured in there! It was full of intriguing exhibits and displays for sure. That’s such a nice thing for the two of you to do!! Glad I have my little man to join me. Couldn’t ask for better company. I love all the fun adventures you and your family go on and that your son poses so sweetly for your photos! Thank you Hilary! He has his moments though – he doesn’t always pose nicely!! I do love Wahaca possibly one of my favourite ‘grab a bite’ places! The museum looks very interesting. I love that the building is fairly modern even though it houses such history! 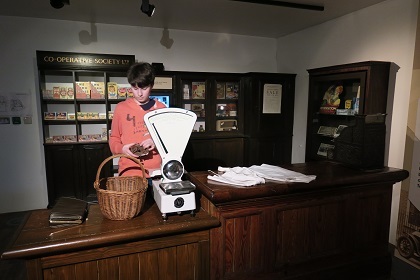 The food there is just great and the museum was a real gem – can’t understand why we’ve never been inside before! I like the sound of that – weekly Mexican food would be wonderful! I don’t know how you find these places but they are always very cool and interesting. Love this one, Joy. 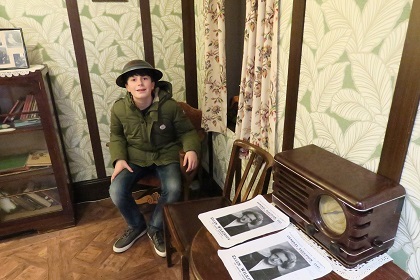 We enjoyed the afternoon George – great fun and an interesting museum, perfect! I find that Wahaca can be very hit or miss. There are about a million locations in London now, and some are pretty decent, but others are kind of gross. But being from America, where Mexican food is much more common, I tend to be kind of a snob about British Mexican food, and prefer the stuff I make myself! 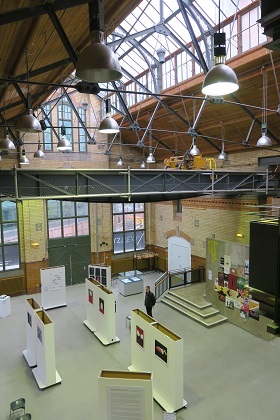 The museum looks great though! Sounds like a fun day out! 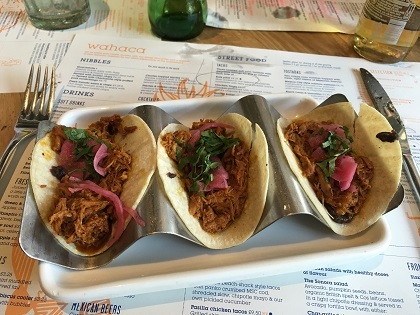 Thanks for the review of Wahaca, there’s one in Edinburgh I’ve been meaning to try. We enjoyed the food – really tasty and very reasonable especially at lunchtime (when we went). Hope you like it! !